The entrance is quite simple: a concrete slope with bike racks. 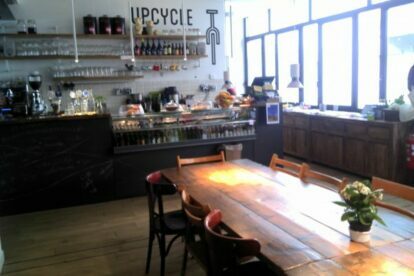 Upcycle is located in a former garage (this is the reason for the concrete slope and the name). The eating area is a long, rectangular lounge with big windows and pipes all around (even the table legs are made of pipes). There are three long wooden tables that go from one side to the other and everyone sits beside strangers, as is apparently common in the northern countries (not in Italy). Upcycle has delicious home made cakes (try the Bavarese, a cream and strawberry cake with a dark chocolate biscuit base) and Scandinavian dishes. Food is delicious but don’t go if you are in a hurry: waiters are really friendly but extremely slow, and this is done on purpose to make this a social place, not an eat-and-run bar. From the dining area you can see the co-working area where events for the bike lovers are organized, such as book presentations or talks held by bike travellers. See the calendar here.